Five hundred years ago today was the date we now commemorate as the start of the Protestant Reformation, and the Art Institute of Chicago put out this row of unassuming little prints of Martin Luther to mark the season. None larger than about seven inches tall, they show the man in different stages of life. Choose your favorite! My mother acquired three old kitchen chairs that had belonged to her grandparents, but the caned seats were deteriorating. Once my father's supremely handy aunt and uncle were visiting and the chairs came up in the conversation. Well, heck, it's no big deal to recane a chair, they said, and took them home with them to Indiana. Mom insisted on paying them, despite much argument. In the fullness of time the chairs returned, beautifully recaned. But Mom had a conniption when she realized that it was plastic "cane," not real. That had not come up in the conversation. Mom thought that plastic had defiled her grandparent's precious chairs, and indeed, their precious memories. She berated herself for not having specified authentic cane for the job. She couldn't stand to even look at the chairs and stashed them in the attic. We talked about this one day and I said, I'm sorry you can't stand to even look at them; I think they're pretty nice. If that's what you think, she said, you can have them. So the chairs came home with me and have been making themselves beautifully useful for a long time. One served as my sewing chair for many years. 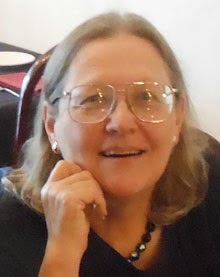 After we bought elegant upholstered chairs for our dining room, and I realized the seat was too high for me to get my feet comfortably on the floor, I sat in a caned chair for a decade, even though it didn't match anything else in the room. Currently two of the chairs reside in our front hall, convenient for depositing the mail, the newspaper, a package on the way to the post office, or your hat and gloves. One lives in the dining room, ready to be slotted in when we need to squeeze three people along one side of the dining room table without putting in the extra leaf. If we need one someplace else, they're light enough to be carried all over the house. For a while I shared Mom's opinion of the plastic cane, even while welcoming the "ruined" chairs into my life. Then I decided that plastic was probably an excellent choice for chairs that were going to be seriously used. In 30-some years it hasn't faded, stretched or frayed. It doesn't scratch your legs if you're wearing shorts. It looks sharper than the rest of the chairs, whose carved ornamentation is starting to lose its veneer. So Mom, you were wrong to disdain the fix-up job. But you were right to let me have the chairs! Another look at the "Southern Accent" show that just closed at the Speed Museum in Louisville. Forgive me for sounding jaded, but one of the cliches of our stereotyped vision of the South is the quilt (you know, everybody's grandma made them...) and one of the cliches of the quilt is that old Underground Railroad myth. How romantic to think that people would hang quilts on the line to point the direction to freedom or to mark the place for a free supper or a bed in the corncrib. How romantic, but how silly, upon further examination: how many poor people just happened to have a quilt in the appropriate secret-code pattern on hand, and how would they hang it on the line when it was raining, and wouldn't vigilant sheriffs and slavers notice that the same people had a quilt hanging out every day? Sure enough, the signage on one big work in the show tells us -- falsely -- "Some quilts were used as signposts for safe houses along the secret network of routes from southern slave states to northern free states and Canada." I am so sick and tired of hearing this fake news. Only a few weeks ago I griped about it in my blog, in response to a review of work by -- well, well -- the very same Sanford Biggers! So I wonder -- does the fake news come from the ignorance of the reviewer, as I had thought while writing that post, or does the artist plant it in his statements, as you would infer from reading the sign? Oh well, let's talk about the art, not the propaganda. He's painted with metallic and day-glo colors onto a beautifully made Irish Chain quilt, which incidentally is in pretty fine condition. The quilt wasn't stiffened or stretched, just hung against the wall. More art from the Southern Accent show next week. Whenever I go to an exhibit that's not specifically fiber art, I look for fiber, always intrigued at how a material that is often considered a second-class citizen takes on substance when used by a painter. I found several pieces incorporating fiber in the "Southern Accent" exhibit that just closed at the Speed Museum in Louisville. Most of the painting is flat, including some fabric used in the dress. But the artist has constructed a huge nose jutting out from the picture plane, almost two inches deep, apparently molded from fabric and stiffened with paint or medium. The hat also comes out from the surface to shade the nose and brow. The painting was hung along the right-hand wall as people entered the exhibit, so your first view was the nose shape protruding from a foreshortened surface that you could hardly decipher; it was strange and off-putting. I wish the painting had been hung at the corner facing the flow of traffic, so the first view could have been the full image, and you could have discovered the 3-D effect only on closer examination. Next, a huge wall hanging, made from a tarp painted in various indigenous southern substances including dirt and tobacco. The large expanse, barely interrupted by a few appendages (can't tell if they were original to the tarp or added by the artist) and hand stitched African and voudou symbols, presented a calm background that focused your attention on the small black head perched on a rock. More on the Southern Accent show in my next post. We visited Italy in the winter of 2003. With the exception of two taxi rides, we did a whole month depending entirely on public transportation and our own two feet. We packed light, washed out our clothes in hotel bathtubs and wore the same sweater every day. But in Sorrento we strolled through a market street and saw a kitchenware store with a table of sale items on the sidewalk. We spotted some nice pasta bowls for an amazing 1.25 euros apiece -- at the time, about $1.15 -- and couldn't resist. We bought four and shlepped them back to the hotel, a long enough walk that we traded off carrying the bag once or twice along the way. Before we made it home for good we had carried those bowls about four miles, making our way between hotels and railroad stations and through airports. With every step they got a little bit heavier, and we had to remind ourselves that the bowls were beautiful, a steal, and our only souvenirs of the trip. We had invested not just the five bucks but a heck of a lot of sweat equity to bring them home. But it was worth it! 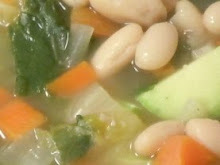 They have become our default bowl for pasta, not to mention the occasional soup or other juicy entree. I suspect they've been used at least once a week since we returned, and we never fail to think about our wonderful trip when we eat that last bit of food and reveal the red tomato. Isn't technology wonderful? With the Internet at our fingertips, we can find out anything we ever need to know in milliseconds. Well, sometimes it works that way. After shipping off a quilt to a show yesterday, I was reminded that I should let our local fiber art organization know so they can post the info in their "see our work" announcement page. But I should also tell them the dates of the show. The hard copy acceptance letter from the museum was still in my shirt pocket from taking it to Fedex to read off the address. But the acceptance letter did not say the dates of the show. I looked up in my email for the notification message, but that did not say the dates of the show. I typed "Evansville Museum events" in google and found no home page for the museum. Instead I got a page from a trip planner website telling me that the museum's nice new facility will be opening January 2014, I should allow four hours and would I like to build an itinerary. No, I wouldn't. But there was a link to the museum website, which I clicked on. Oops. Got the dreaded exclamation point in the red triangle: "Your connection is not private. Attackers might be trying to steal your information from www.emuseum.org (for example, passwords, messages, or credit cards.)" Well, that's scary but I only want to know the dates of the show. The web is so concerned about my safety that it won't even let me take the risk and see the site anyway -- my only choice is "Back to safety." North Korean hackers can infiltrate the site of any place I do business with, steal my social security number, plant ransomware on my computer, but at least I'm not at risk at the Evansville Museum! What a relief. I googled Evansville Museum again and found a link to their facebook page. Under the "events" tab it showed several events in October and November, plus one next March and one next August, but not the December 9 opening reception (they did mention that date in the acceptance email). I scrolled through their posts, reading as far back as August, but no mention of the show. Back to those emails. They show the same website that I'm not allowed to go to, for my own safety. Hmmm. I googled "Mid-States Craft Exhibition" and aha -- toward the bottom of the page, founds a listing for "Art Museum, Movie Theater, Attractions: Evansville, IN" and it's the museum's own website! Not the same URL as the one on their stationery, or the link in the emails, but an actual working SAFE website! And it only took me 35 minutes to find it out (that's slightly less than one millimonth). But anyhow, if you find yourself in the vicinity of Evansville over the winter, drop in and see my flag. Last week I went to the Speed Museum in Louisville for the last day of a blockbuster show called "Southern Accent: Seeking the American South in Contemporary Art." I wish I had gone earlier in the run so I could have gone back again; there was much to see and think about and I will have more posts, but let me start with one artwork, described as a "sculpture and performance piece." 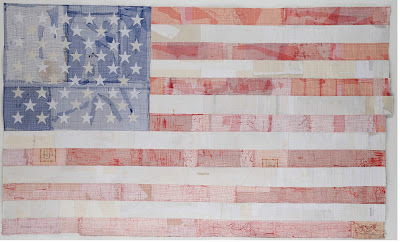 It's a found Confederate battle flag which the artist is slowly unraveling by hand. She started in 2015 on the 150th anniversary of the end of the Civil War and has been working on it ever since. For two hours on the last day of the Speed exhibit, visitors were invited to help Clark unravel. Each person was greeted with a handshake and introduction, and then set to work unraveling, side by side with the artist. For a couple of minutes each visitor worked, chatting with Clark about the project, then parted with a hug. Of course I had to be there for this performance, and I said I wanted to work on the white, "to unravel some white privilege." I was surprised at how difficult it was to take the tightly woven threads apart with no tools -- at home I would have grabbed a seam ripper or awl to grab the weft threads and pull them away, but with only fingernails it was hard to get a grip. When I commented on this, Clark responded metaphorically that it's hard it is to deconstruct racist history. I wondered how many times she had made this comment to her visitor/collaborators in the many hours she has spent shoulder-to-shoulder on the project. I was thrilled with this idea of taking the flag apart. The project hits all my hot buttons: U.S. history, lingering racism in the south, flags, and of course, fabric. During the time I waited in line for my turn at the flag, I couldn't help but think about the art project that I participated in a couple of years ago at a museum across town, where volunteer artists mended people's clothes. In both cases, the time spent in conversation between artist and visitor was intended to be meditative and connective. I don't think the flag unraveling was conducive to much meditation. It turned into quite the mob scene (which is wonderful in itself, because how frequently do you find mobs in museums, but I wondered how much time many of the visitors spent looking at the art). With a long line of people waiting behind, there was pressure to unravel for a very short bit and then move on. As you approached the head of the line, museum staff with clipboards took your name. As you worked, photographers came in close. After you departed, reporters asked for your reactions. By contrast, the mending project offered much more intimate time for conversation -- simply because there were so few people who came by. But there were more than 100 hours of artist-on-duty time in that project, compared to only two hours for the flag. We asked one of the guards who herded us into line whether the crowd was bigger than they had expected; he said nobody had any advance idea what was going to happen. He seemed cheerfully overwhelmed, but I wondered whether he would be equally cheerful at closing time when dozens of people still in line would have to be turned away. I would have loved more time with my hands in the threads, and more time to talk with the artist, but when the museum presents a "relational" project as merely a two-hour event there isn't much relating that's going to happen. As we waited in line we also talked about Marina Abromovic's massive relational project at the Museum of Modern Art in 2010, where she sat in a chair silently contemplating a visitor sitting across from her -- seven hours a day, six days a week, for 700 hours in total. I'm sorry Sonya Clark didn't have the chance to spend more time with her art piece and with museum visitors, just as I was unhappy that Lee Mingwei hopped a plane to Tokyo after installing the mending project, delegating the visitor-relating to us volunteer artists. Strikes me that both of these projects, brilliant in concept, suffered for want of boots on the ground. As a professor of graphic arts, my father was an inveterate collector of all things related to printing, an enthusiasm that washed down to my own generation. Our favorite method was letterpress -- where the letters or images are raised above the surface of the printing plate to accept ink rolled or pounced over the top, like a rubber stamp. But just to make the collection comprehensive, Dad acquired some lithographic stones. Lithography works in a non-intuitive manner: the image and the printing plate are perfectly flat. The ink adheres to the image and not to the rest of the plate through basic chemistry -- because oil and water don't mix. Start with a porous stone, perfectly flat. Draw on it with a greasy crayon or paint. Slosh water over the entire stone; it will be repelled by the crayon but absorbed into the background areas. Roll greasy ink over the entire stone; it will be deposited onto the greasy area of the image but repelled by the water-wet background. Now you can print the image onto a piece of paper. Commercial printers were apparently quite frugal with their raw material, the heavy and painstakingly milled stones. Both of these stones have several letterheads and documents crammed as closely together as possible. Apparently the cost of making a separate stone would far outweigh the extra care it would take to print just the one you want. The printer must have had to do a lot of tricky masking to make sure just the right one got printed! 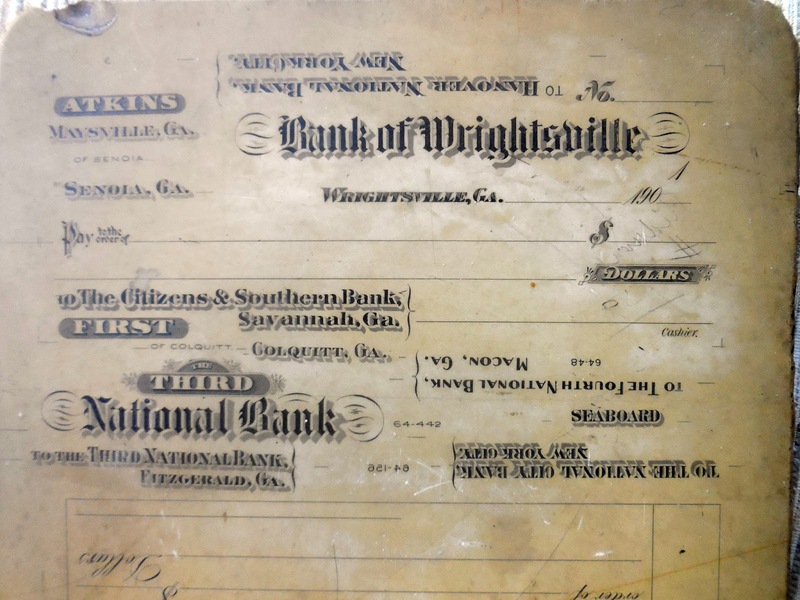 In those days, financial papers typically included a blank space for the date, printed like this: _______________ 190__. 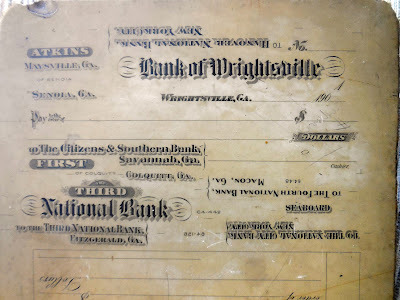 Maybe a clever way for the printer to insure that people came back and had new letterheads printed at least once per decade. The other stone came from Paris; it has letterheads for a dressmaker, an electrician, and a stockbroker, if my bad French is correct. It was a decade later, 191__. I was reminded when I pulled the stones out for photography just how heavy they are!! My brother, who lives in Australia, reminded me the last time he visited that one of the stones actually belongs to him. I told him he was welcome to take it home with him, but since he's always just a nanogram this side of the weight limit, he declined. So I think both stones are going to stay with me forever. The first amendment installation is finished -- awaiting transport to the banquet site next week. I hope the people are all firmly enough anchored into the base so they can survive the trip. I'll drive slowly. But if not, I'll take some extra wire along so I can jam the armatures more snugly into the holes on site. I love the way they're crowded together, peaceably, just like it says in the constitution. When I started making daily people in January, I was intrigued by the way limp fabric could become firm simply through wrapping and tying. A few friends to whom I showed the project were surprised to find that the people had no armatures, because they had a lot of structural strength -- that was the whole point of my exploration. But most of the little guys didn't have enough structural strength or balance to stand on their own. So when I got the opportunity to put them all into an installation, I needed to retrofit some skeletons into practically everybody, extending into a peg that could be fit into a drilled hole on the base. Some of the people were constructed so I could easily run a support wire up under their skirts or thread it up inside their legs. Others had been wrapped so tightly, and perhaps had some internal folds and creases, that I couldn't force wire through the center of a leg, so I had to snake an external wire up the back of the body, secured by their original wrappings. That's how I spent my weekend, with wires and wirecutters. I could have saved a lot of time by putting the wire inside in the first place, but would that have been any fun? Heck no! I'm almost done with the installation -- I'll show it to you soon. My mother gave me a crystal ball -- not for fortune-telling, but to hang in my kitchen window. It's about the size of a golf ball. When the sun is at the right angle, and if I have wiped the ball clean of grease and dust, and put a little spin on it, brilliant little rainbows dance throughout the room. It varies with the season, of course, but this week rainbow time starts about 8:30 a.m. and lasts maybe 20 minutes, 20 minutes of pure magic. There's nothing more gratifying, if you have written an article or a book, given a speech or taught a class, than to have somebody tell you they used what you said to make something nice. 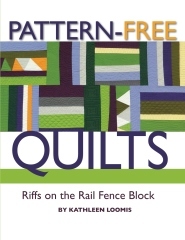 So it was great to find an email from Diane Lewis with a picture of a quilt she made from the ideas in my book, Pattern-Free Quilts. 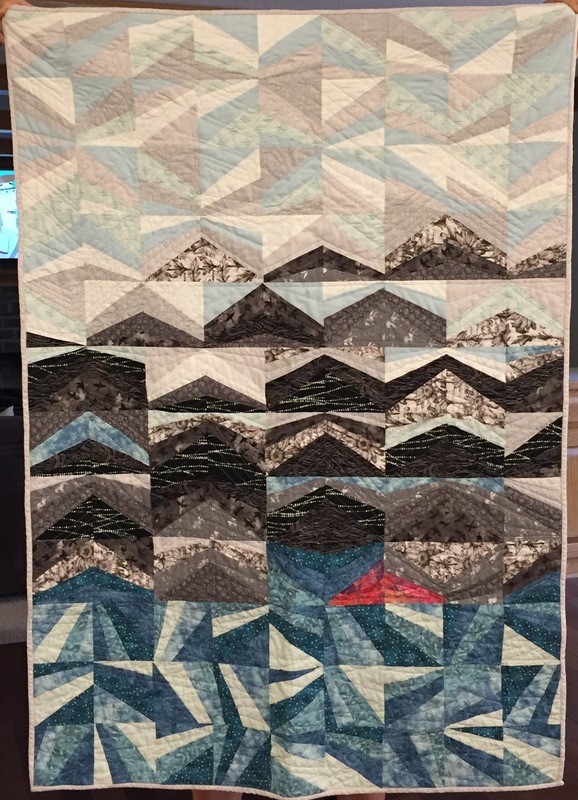 She wrote: "I stacked fabric rectangles and cut them into four pieces, then swapped the fabrics around and reassembled them to form diagonally striped blocks, which I laid out in an abstract mountain lake pattern. Thanks for the inspiration!" I like the three different ways Diane has arranged her striped blocks. 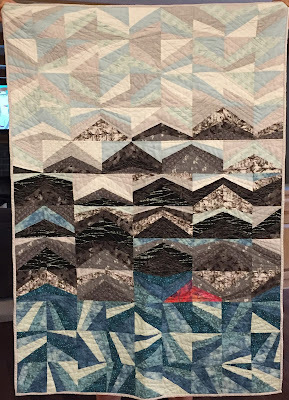 In the center, the mountains are made with a regular pattern to make peaks and valleys. In the sky, the diagonals all slope gently in one direction or another, but two down-slopes might be adjacent, giving the impression of clouds and breezes. In the lake, the diagonals go every which way to make waves and currents. Subtle, and very effective! And thanks to Diane for reading the book, and making such a nice quilt, and sharing the photo! We're now starting the fifth week of construction work on two projects: rebuilding two decks and combining two small bathrooms into one glorious big one. I think we're past the midpoint on both projects, but who knows? I can still access my studio, but guys are sawing and pounding right outside the window, and more important, I need peace and quiet to decide what to work on next. So I've been going through piles of old newspapers, some of them dating back years, reading all the art reviews that I had set aside, clipping as needed, throwing away what's left. Reading books. Spending time with the new grandchild. Most of the time, I'm not really needed here, but every so often there's a decision to be made. Who knew it would take a half hour to determine how to install the lights and switches in the bathroom? Should the light over the sink go on when you turn on the room lights or be on a separate switch? Should the fan come on automatically with the room lights, or automatically with the shower light, or on its own switch? Should the light be directly over the tub, or centered over the floor area between tub and shower? Meanwhile, I'm reading about projects that many of my blogging friends are working on, and feeling guilty that I'm not doing anything useful. I can't even concentrate enough to decide what my next project is going to be, let alone start staging up for it. And the year-end tasks -- photo calendars, 55 Christmas ornaments, Christmas stockings for the new baby and maybe others -- are looming. When I was a senior in high school I saved up my babysitting money and bought a record player, which meant I needed to acquire records. For some reason, I decided that what I wanted to hear was classical music, and having joined the Columbia Record Club, with its infamous negative option membership setup, I soon amassed lots of music. Despite flirtations with Motown and Broadway, I remained a classical girl at heart, and was delighted to learn that my husband-to-be also loved classical music and had his own bazillion records. Records, of course, are hard to integrate into your daily life, because they require tending, even if you have a turntable with a changer to drop a new one into place when the old one is finished. You can only reliably hear the music from the same room, which doesn't work if you're doing housework or tending children or making dinner (whoever would have put their record player in the kitchen???). Fortunately we've been blessed in Louisville with great classical radio. For several years in the 1970s, we even had two classical stations! If you didn't want to listen to Hindemith, you could flip the dial and see if you could get Tchaikovsky on the other station! We're down to one station now, but it's 24/7, so we turn on the radio when we get up in the morning and turn it off when we go to bed. Some years ago we stopped at an outlet store on our way home from vacation and bought a Bose radio for Ken's office. It was a splurge, but what a quantum leap in quality from the previous radio (a pale green Grundig that Ken had bought 50 years earlier) in that room. I immediately became jealous, and a couple of years later I stopped at the same outlet store and bought one for my own office. Meanwhile our radios in the other rooms were getting old. The radio/stereo system in the living room was getting increasingly unreliable. We own more than 1,000 CDs, and I realized that CDs are an almost-obsolete technology. I worried that one day the system would refuse to play a CD, and this would occur two weeks after every manufacturer of CDs in the entire world had decided to stop manufacturing CD players. A Bose outlet store had just opened less than an hour from us, and as Christmas approached one year I announced that I was going to buy a Bose radio with a CD changer, in the hopes that it would outlast both us and our CDs. When I got there, I decided to buy not only the radio plus CD player for our living room, but one for our bedroom and one for the kitchen, a total of five. Ken accused me of over-splurging, but I pointed out that if you listen to the radio during every waking moment, why not have great quality? All the radios are equipped with remote controls, and the three new ones also turn off and on if you simply touch them -- a great boon when you're walking through the kitchen with greasy hands and can do the honors with your elbow. I'm not sure whether this works through temperature, pressure or ESP, but it's pretty neat. As is the ability to have music throughout the house throughout the day -- wouldn't Bach be jealous?